Leadership is the key to making schools more equitable and socially just! Key Questions offers 42 short essays from international educational leadership scholars and practitioners on everything from parental engagement to special education to supporting Indigenous students. This book is a valued and requisite resource for both practising and prospective educational leaders. Racism, social class, equity, social justice, spirituality, ethics, accountability, indoctrination, authority, accountability, advocacy, social justice, feminism, spiritual leadership, and critical self-reflection are among the many intangible aspects of leadership covered in this book. i). What does racism have to do with school leadership? ii). Why should school principals think about social class? iii). How can educational leaders support sexual and gender minority students in our schools? iv). What is feminist leadership? v). How should student voice impact educational leaders? vi). How does educational leadership influence student learning? vii). How can educational leaders promote mental health in schools? Each question and response will provide the reader with insight into the challenges and tensions as well as next steps. This book is the most comprehensive book on educational leadership on the market and its greatest strength is found in the 42 authors ability to connect the theory and practice with improving schools so that all students benefit. 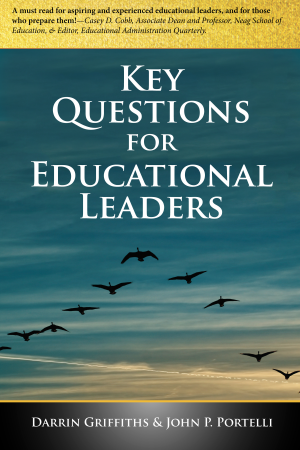 View preview PDF for an inside look at what you find in Key Questions for Educational Leaders! Key Questions for Educational Leaders is a terrific book. The multiple and diverse authors invite readers to consider and reconsider the complexities of leading schools for liberal democratic societies. Furthermore, the editors of this volume have done an outstanding job in weaving the multiple authors and their viewpoints into such an engaging and provocative book. Key Questions for Educational Leaders should become standard fare in educational leadership circles and well beyond. Both theoretically sound and practical, Key Questions for Educational Leaders is a stunning compilation of essays that span across important epistemological tensions often ignored in the literature on leadership studies. The volume is absolutely a gem for inspiring dialogue within both the classroom and larger community regarding critical concerns vital to a critical praxis of social justice—one not only committed to emancipatory ideals but also to genuinely transforming the world for the better. Antonia Darder, Leavey Endowed Chair of Ethics and Moral Leadership, Loyola Marymount University. Whether you’re an aspiring leader, a newly-appointed one, an established/experienced school leader or even a consultant one, there’s something in Key Questions for Educational Leaders for you. The book could be used to build capacity, to create confidence, to pose hard question, to challenge or just to generate curiosity. Extensive bibliographies accompanying the articles can be used for additional reading or further research. In short – a gem! Clive Byrne, Director, National Association of Principals and Deputy Principals, & President, European School Heads Association.